Our own food intake seems to be hard enough to control without the need to worry about our pets too. As the years go on it seems that the weight control problem around much of the civilised world is increasing. Year on year since the 1980s the percentage of the UK population that is considered obese has been rising. This may not be something that can be easily fixed, although most nations have the opportunity and means to improve it. The ability to teach children better by getting them to eat more healthy and do more exercise doesn't sound impossible, but it hasn't seemed to have made a huge dent in waistlines over the last few years. This problem does not stop with our own kind, it is present in the lives of our dogs and cats too. This is something that could and should be tackled, and with good reason. Even small amounts of extra weight on animals can affect their health in vast ways, causing disease, mobility and other serious health problems. It can be a lot easier to control what our dogs consume, more so than our children. As owners, we are the only ones that feed them so we can ensure that what they are taking into their body is what is really required. Feeding well from young is not the only way a healthy life for a dog can be achieved. There is no reason why many overweight pets cannot have their lifestyle looked at for improvement. If they are already a bit on the podgy side, we can take steps to help shed some of this excess weight with well thought out exercise routines, and a good diet suited to each individual animal. Luckily there are diets available that can help our pets get into better shape without first splashing out on all sorts of different supplements. Hills Prescription Diet Metabolic Advanced Weight Solution is one of these which helps safely achieve an appropriate weight loss in your dog. By feeding them the correct amount of food daily, which can be advised by your veterinarian, you can bring their weight down to a healthy level and maintain it. It doesn't just work by feeding your pet a smaller diet, like many people losing weight might do, it contains breakthrough nutritional properties that work individually with each pet's metabolic response, to lose excess weight and help maintain a healthy one. 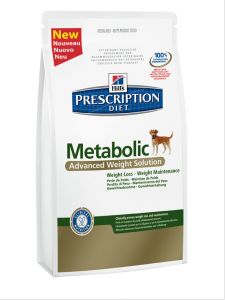 Hills Prescription Diet Metabolic Advanced Weight Solution is clinically proven to provide a 28% less fat content within 2 months as it controls your pet's hunger, making them fuller for longer. With a recorded 88% of tested pets losing weight within 2 months, there is hardly a better way to give your dog a more healthy, active life. By slowly introducing your overweight dog to this diet you are actively reducing the risk of harm to them, both now and in the future; and with the wet and dry options available now you can choose the option that suits your dog the most.